Hi, I took Percocet a little while ago and feel very tired. Sorry if there are typos. Sleep last night was pretty easy. I was really tired and napped on and off all evening lol, and then finally went to sleep at about 12:30am. I woke up once at about 4:30am to feed Cecil his breakfast (that’s his normal breakfast time) and my legs felt okay, and then I went back to sleep until about 6:30am when I woke up for “work.” I was working from home but still wanted to make some coffee and stuff lol. I opened my planner and looked at my to-do list but then I closed it and just started doing whatever felt right. We use a project management system so it’s fine to just like login and look at to-dos in there too. I slept on the couch all night because I couldn’t climb the stairs to go up to bed. No big deal. Adam slept upstairs but Cecil slept with me. He tried to lay on my legs once but I said nooooooooo and then he left them alone. He’s a very smart cat that possibly understands English. It’s something that should be explored further. Look you can see here that he laid next to my legs but not on them because he understood. I’m sorry that my legs look weird and lumpy. They are a little swollen and then the bandages on the right are wrapped really nicely but on the left they are a mess. No, I meant on the left they are wrapped nicely but on the right they are a mess. My mom pointed that out to me.I was going to delete that sentence and type it the right way but that feels like a lot of extra work :). She came over at 10am and sat with me while I worked and made my PT appoints. I go to my first PT appointment tomorrow. I hope they don’t make me do anything that hurts. I walked around a lot yesterday and also stood a lot. My legs were really feeling great and I was like, I am basically pretty much almost totally recovered. Mind you I have a little limp but I’m not using crutches. I think I may have overdone it on the walking a bit because then my legs started feeling sore – or like more sore than they were before. Then at around 4:30pm to 5pm my left leg started hurting. Like burning. So then I got on the couch and elevated them with 3 pillows and took 2 percocets and that was just like maybe less than an hour ago now. I feel drowsy and I left my blog planner upstairs so I’m not sure what I was supposed to write about today if anything so I thought I would just give an update. 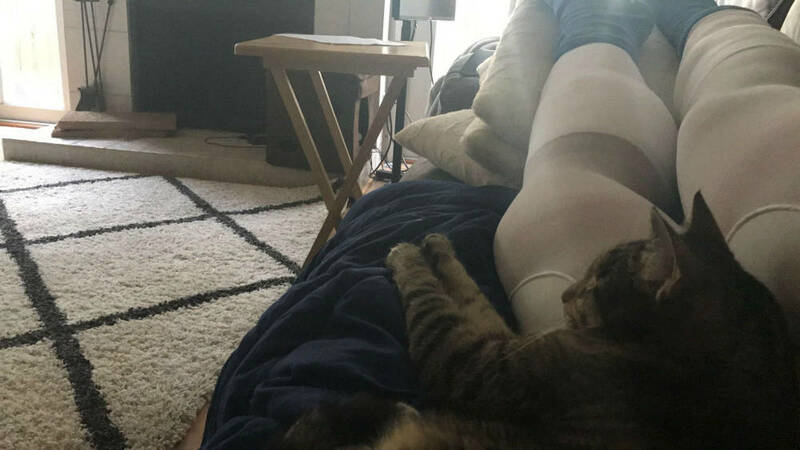 I hope this can be a resource for anyone out there who ever has to have a bilateral fasciotomy due to extertional compartment syndrome because the blog legsonfire.wordpress.com really helped me a lot leading up to the surgery. Previous Post The Comeback Begins! Next Post Exercise Benchmark Has Been Set! Glad the recovery is going well so far! Its awesome that you can walk around already. Good luck with PT! 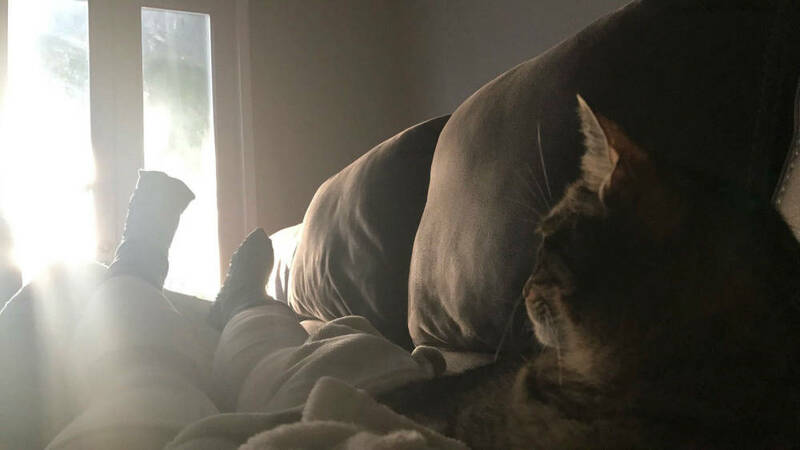 I love how cats know when it’s time to comfort us. 🙂 Are you working from home all week? Ohhhhh no! This post should not have gone up lol! I am all over the place in it. Just to clarify, my first PT appointment is actually TODAY. I’m about to leave now! Bahaha, glad those drugs are relaxing you 🙂 Hope PT goes well and they aren’t making you hop on one leg, or do some Irish river dancing or anything…. You are doing GREAT! Keep it up and you will be back to running in no time! Cecil is such a good kitty. I’m glad he’s keeping you company on the couch and knows to stay off of your legs. Hope your PT appointment goes well! I hope your recovery is going well today! Sending healing thoughts your way! Pain meds will make you feel a little wonky lol but it is good to keep the pain down. I hope they didn’t hurt you today!! get back on your feet girl, lots of running ahead! Fast recovery!